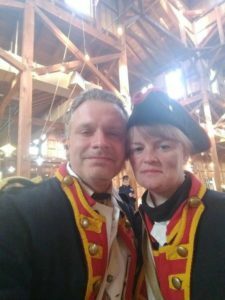 Mary and Mike Skelly, who graduated from Hartford in 1987 and now reside in Salem, are members of the Second Continental Artillery reenactment group which led to the chance to be extras on the popular series. When the opportunity presented itself, Mary and Mike knew they couldn’t turn it down. Bradley Allen, another member of the group, also was an extra for the show. Elementary is a CBS television series based on Sir Arthur Conan Doyle’s Sherlock Holmes detective stories with contemporary twists. It stars Jonny Lee Miller as Holmes and Lucy Liu as Watson.